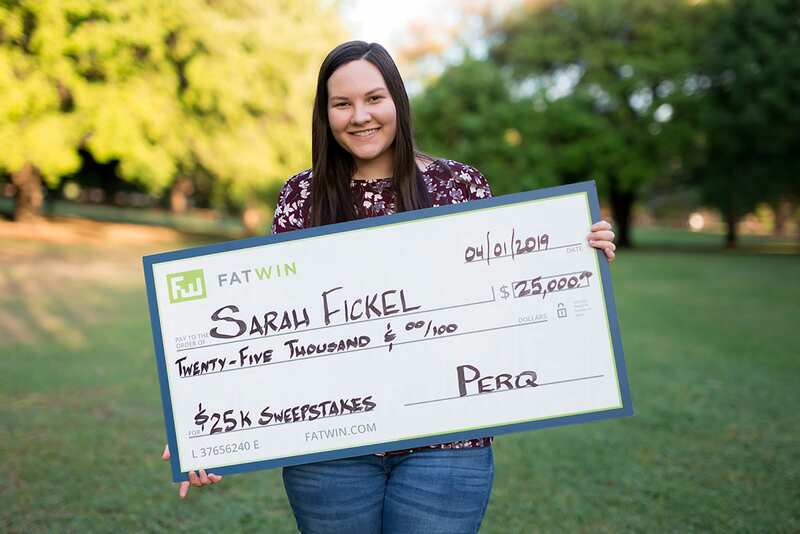 Two weeks after Sarah Fickel moved to Austin for a new job in communications and client experience for a startup company, her car broke down, so imagine her excitement when she found out she won $25,000 from PERQ for the annual FATWIN Sweepstakes. “The trip from Indiana to Texas didn’t do me any favors. In fact, I just had gotten a scary quote from the mechanic when PERQ sent me the greatest email I’ve ever received,” Sarah says about being notified that she had won. Her initial reaction she admits, however, was skepticism. On 10/18/2018, however, Sarah had engaged with the PERQ software on The Marlowe Lake Boone apartment website, a property in Raleigh, North Carolina. She had shared her name and email when she engaged with PERQ’s New Customer Welcome experience, checked a box to enter into the FATWIN $25K Sweepstakes, and continued to look at floor plans. Today, Sarah admits she remembers searching for an apartment but not entering the sweepstakes. I followed up with a call to Sarah, and just a few moments later, she picked up. I explained to her how to claim her prize and I could tell she was starting to believe that she was indeed a winner. I found out she had been apartment hunting in Raleigh when she was interviewing for a job there, but got an offer in Austin, Texas, and moved shortly thereafter. A few weeks after being notified, Sarah received her check and has been looking at different vehicles, but hasn’t made a decision on what to purchase just yet. She’s also hoping to take a trip to Poland and says she’d like to donate some of the money she has won. Sarah adds that she and her brother are both glad she ignored him and finally picked up the call from PERQ. Although she’s never won a contest or sweepstakes before, she says she now considers herself lucky. “I just feel so grateful,” she says.